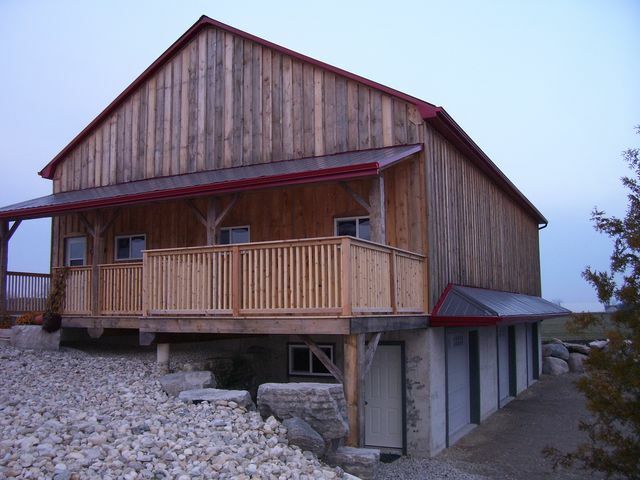 This barn is very typical of the type of hand hewn timber frame structure that was built in Mid-Western Ontario, Canada. It is approximately 40 X 60 feet and was built in the mid to late 1800's. Every barn was built using materials found locally, usually on the very farm where the barn was situated. This stone foundation has been repaired on the barn hill side, but the south side shows the split granite. It was very labour intensive to split the stone and we salvage the exceptional pieces. The grey barn boards is either Hemlock or Pine. 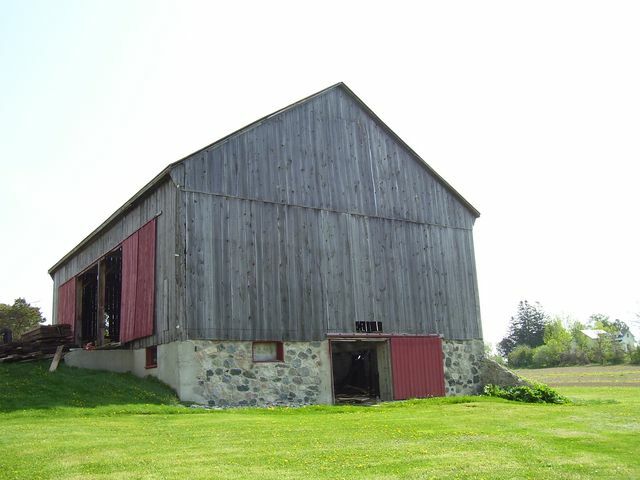 The many years exposed to the weather has given the barn siding a silver-grey colour. The grey barn boards on the south gable of this barn has been replaced with Pine. The grey barn boards on the side wall is the original Hemlock board fastened on with square nails. The upper structure is reclaimed hand-hewn timbers. It can be either hardwood or softwood and often times a combination of the two. The antique timbers range in size from 6 X 6 inch to 12 X 12 inch and sometimes larger. 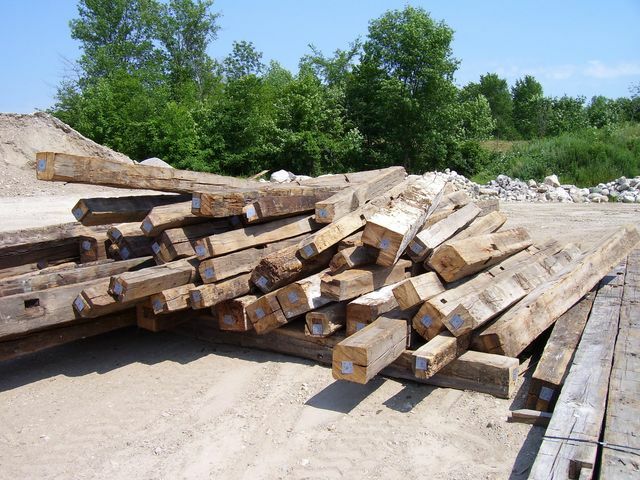 The reclaimed hand-hewn timbers range in length from 8 to 40 feet and occasionally a timber will measure 50' or more. The timber in the floor system is either hand-hewn on one side or on two sides but not all four. We saw these antique timbers into 1 inch blanks and ship the blanks to various flooring mills to be made into antique wide plank flooring. The board in the floor system and the granary walls and ceiling are salvaged as well. This board is generally Hemlock or Pine. This board is also destined to make antique wide plank flooring. 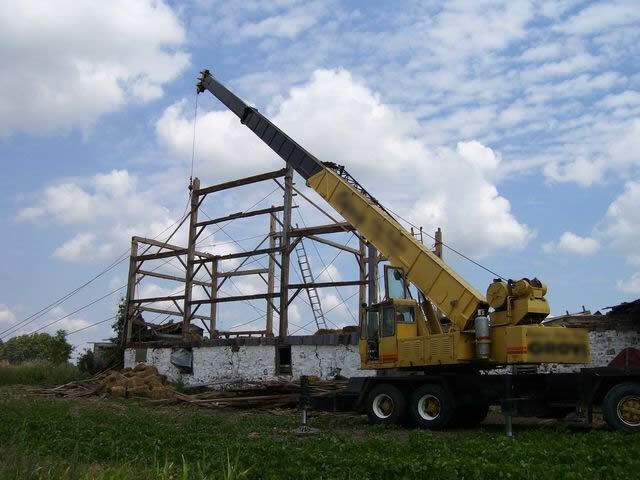 This crane is lowering the bents of this hand-hewn timber frame structure. The barns that are exceptionally well preserved are tagged and blue printed. These reclaimed hand-hewn timber frame kits can be reassembled anywhere. 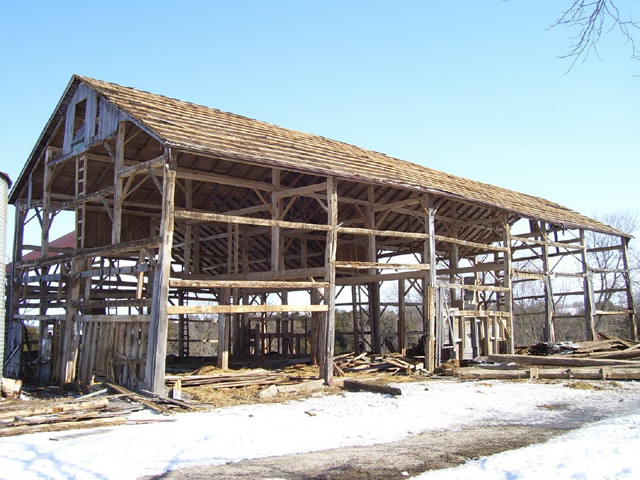 There are basically two styles of reclaimed hand hewn timber frame barns in this area. This is a high post barn with posts reaching from the floor to the purlins. 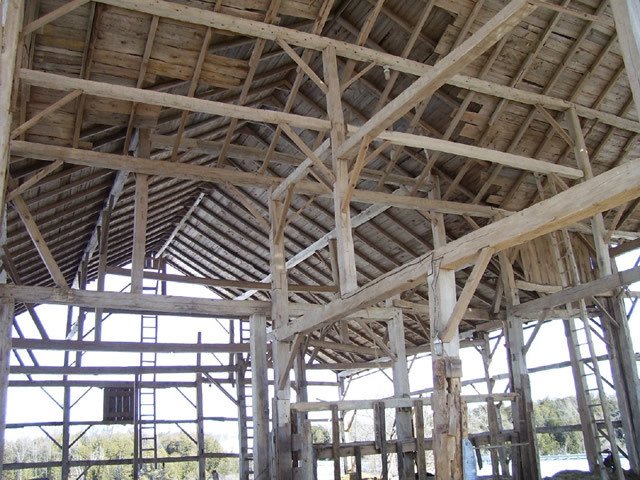 This barn is a tie beam style of hand-hewn timber frame structure. The tie beams reach from one side to the other. The Queen posts support the purlins in this style of timber frame. 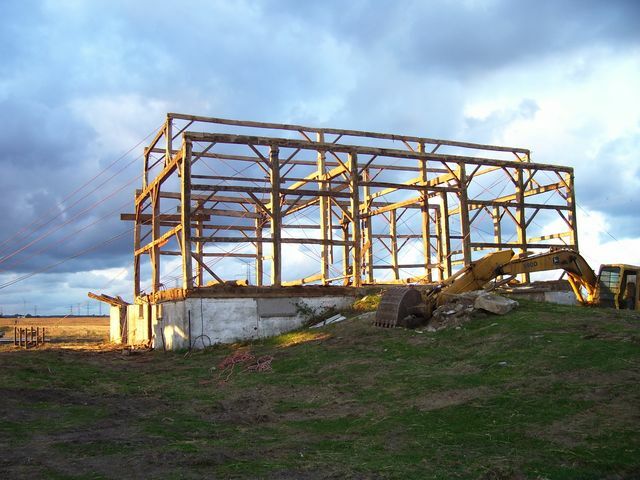 This 34' X 56' hand-hewn timber frame barn is tied off waiting for the crane to arrive. It is tagged and blueprinted and will be converted into a hand-hewn timber frame cottage. This 30' X 50' hand-hewn timber frame structure was disassembled and converted into a timber frame house. The straw shed was sold separately and is now a back yard storage shed. 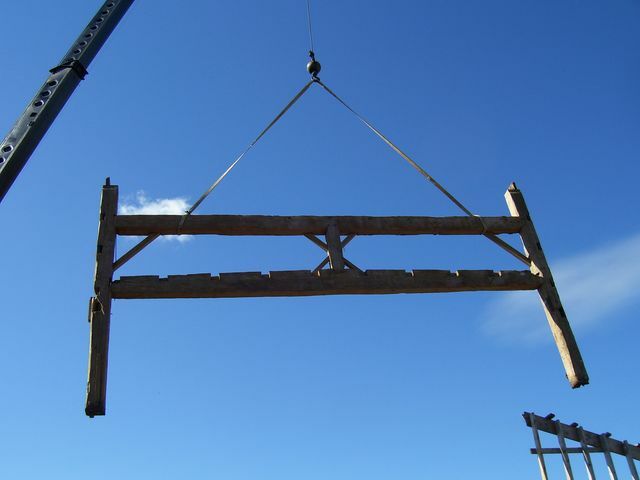 This 30' hand-hewn swing beam measures 20 inches high in the centre and 14 inches high at the ends. It is definitely the centre piece of this hand-hewn timber frame structure. This frame was converted into a home and the swing beam now runs through the kitchen. What a conversation piece! The crane is lowering this 30' bent with a swing beam. Only a handful of barns have a swing beam. 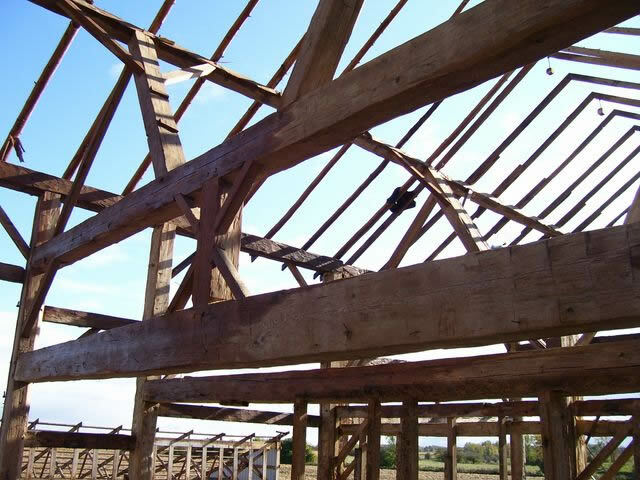 If the barn is well preserved and has a swing beam, it is a perfect reclaimed hand hewn timber frame structure to convert into a home or cottage. 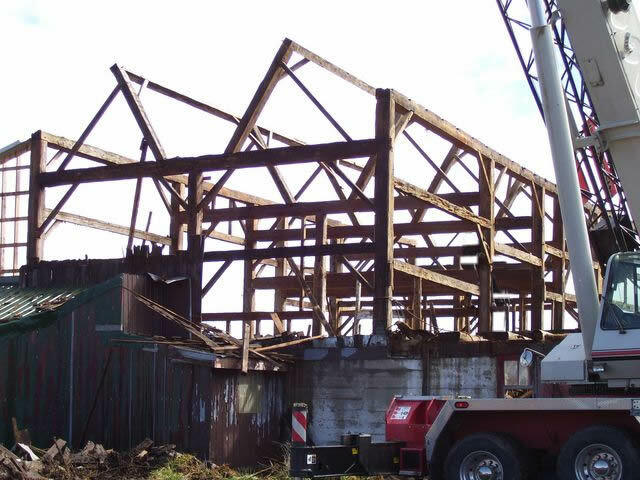 The grey barn boards of this hand-hewn timber frame barn has been removed. The Hemlock granary board has also been reclaimed. 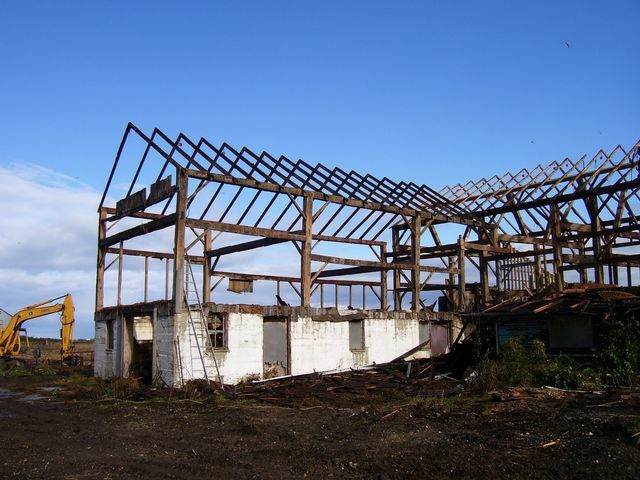 The grey barn boards have been salvaged from this barn. The granary board has been carefully removed. The 1 inch floor board has been removed as well as the 2 inch thrash floor. At this point we are ready to start salvaging the hand hewn timber to be sold individually, not as a frame. The last step is to remove the timber from the floor system to be resawn. 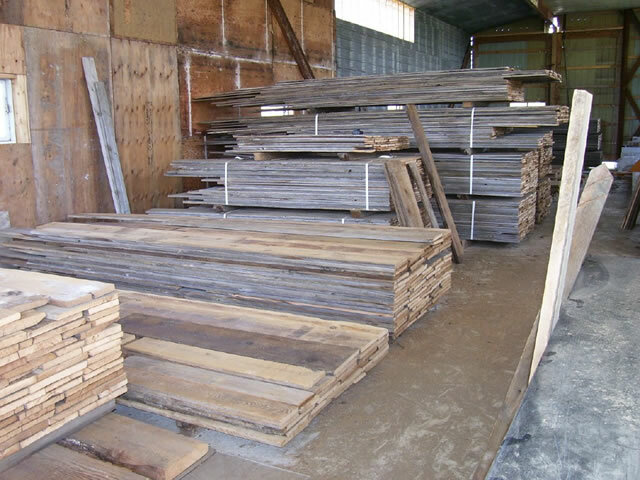 Much of the recycled barn wood ends up as antique wide plank flooring. 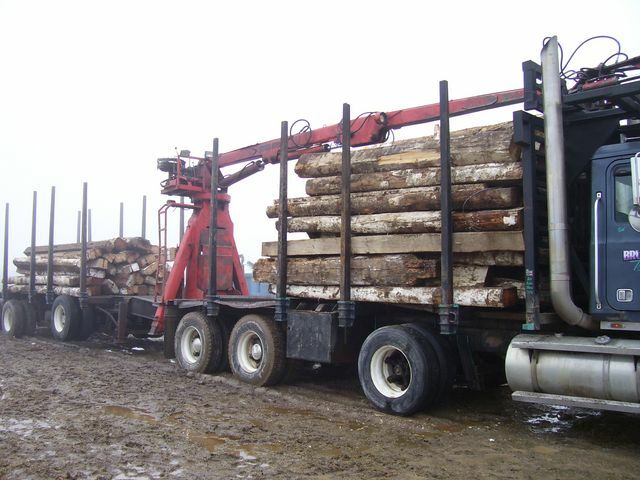 This truck load of reclaimed hand hewn timbers is ready to ship to the United States. The antique timbers shown here is a random load. 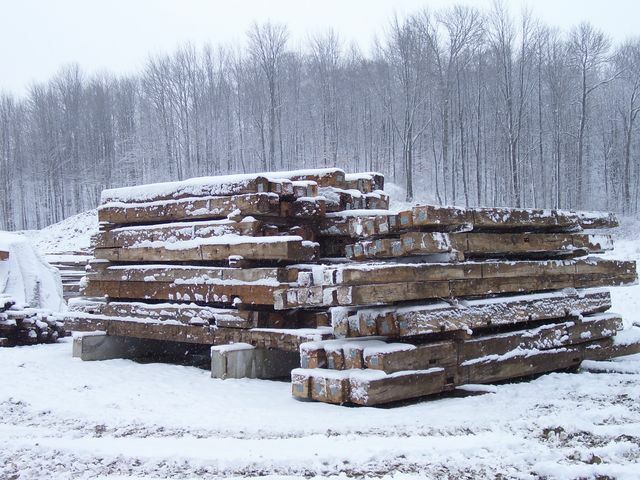 We can fill orders for specific sized timber or for specific species of timber. This is a complete hand hewn timber frame kit ready to ship out. Each piece is tagged and blueprints are supplied. Entire barns can very easily be shipped anywhere. We store our recycled barn wood in a gravel pit. 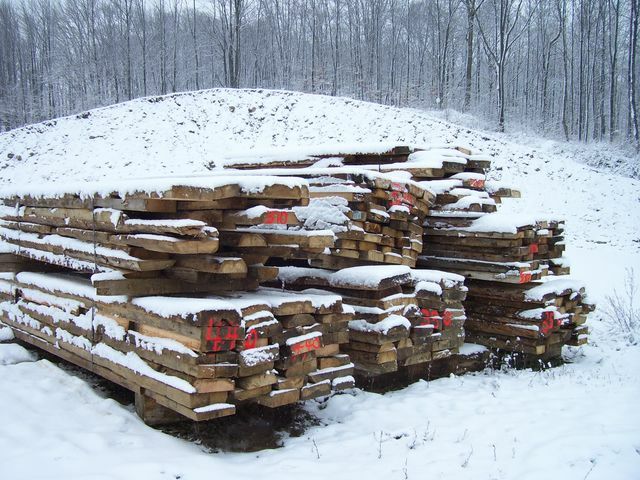 This is where our reclaimed hand hewn timber is graded and sorted by size. 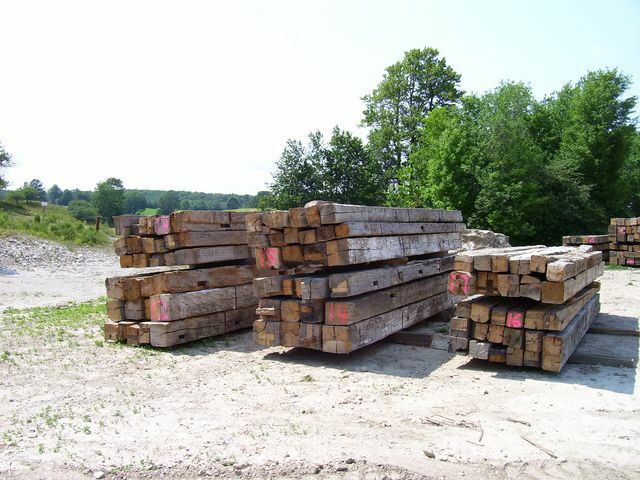 This is an order of specific sized reclaimed hand hewn timbers that we put together. This order is ready to ship out to the United States. 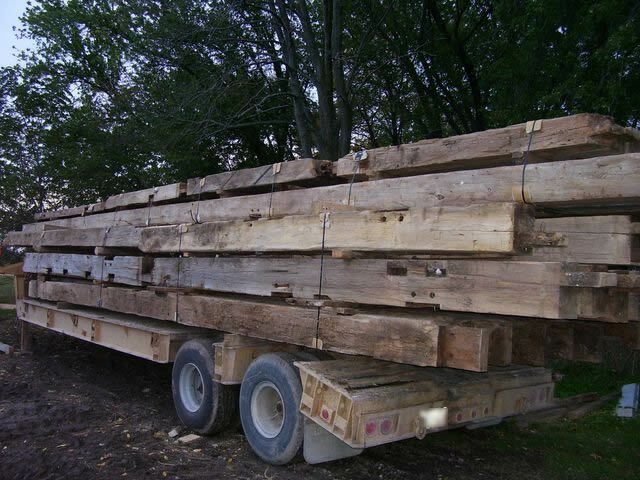 This order of specific sized reclaimed hand hewn timbers is about to be loaded on a truck for the United States. These reclaimed hand hewn timbers are the tie beams. They measure up to 40' long. These bundles of recycled barn wood are 3 inch hand hewn timber veneers. Three sides are hewn and the back side is sawn. This is some of the grey barn boards off of this barn. The Pine and Hemlock will be separated at the yard. 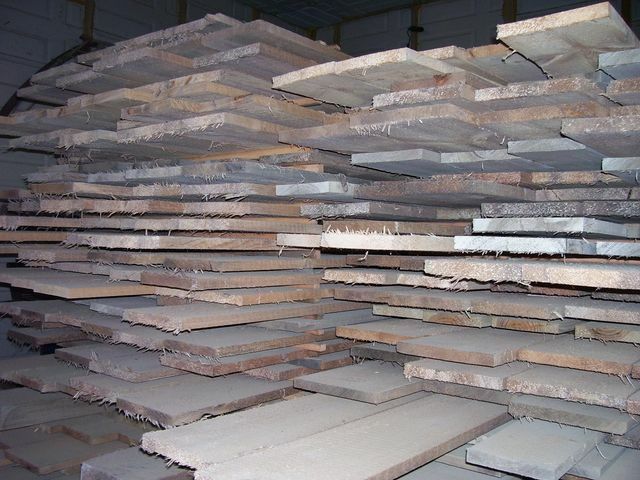 The grey barn boards will also be sorted by thickness. This is one inch original hemlock floorboard. It has been removed from the barn and brought to the shop. At the shop it is denailed, metal detected, brushed and straight lined. It is shipped out to the flooring mills destined to be original hemlock antique wide plank flooring. This is the way that the board comes into the shop from the barn site. It is mixed pine and hemlock as well as some less common species. There is grey barn boards, floor board, granary board and threshing floor boards. This is how we ship the board out. It is denailed, metal detected, brushed and straight lined. It is sorted by species, length and width as well as colour. 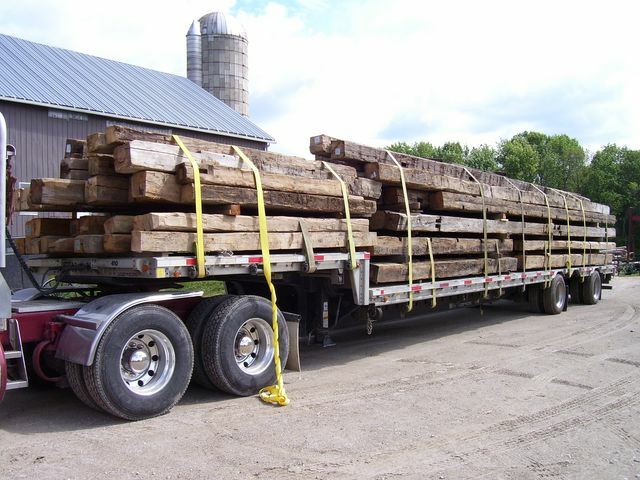 This load of resaw timbers is leaving the barn site. Once the antique timber is at the sawmill, it is sorted by species. Before it can be sawn it must be denailed. This is a very labour intensive process and takes more time than the actual sawing of the recycled barn wood. 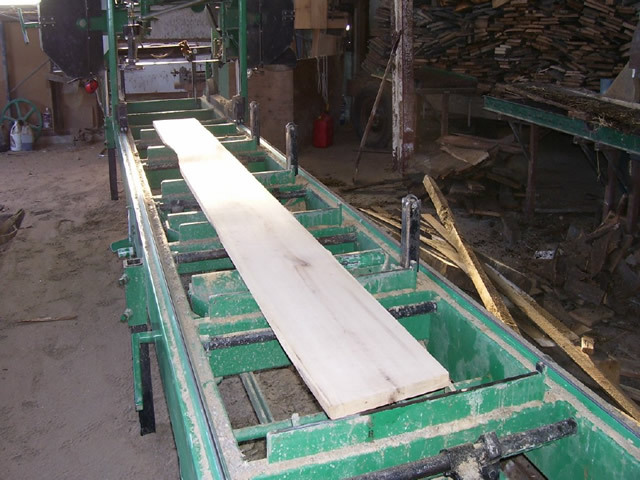 This is a Hardwood blank at the sawmill. This piece of reclaimed lumber originated in a barn floor timber. It is destined to become part of an antique wide plank flooring project. This top piece of reclaimed lumber is Cherry and the bottom is reclaimed Elm. 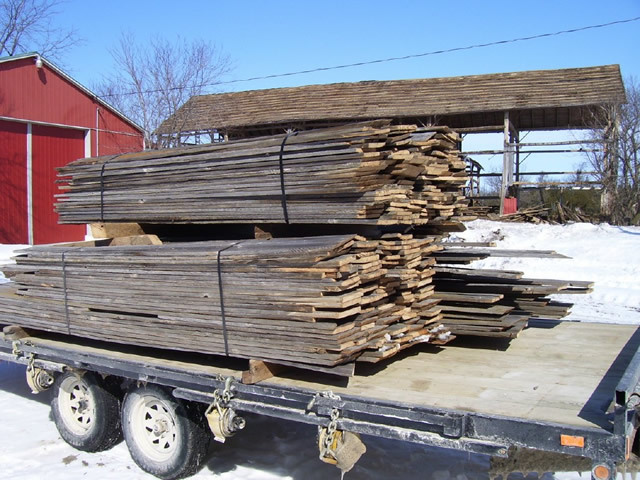 The other species of reclaimed lumber that we have are Ash, Beech, Maple, Pine, Hemlock and Tamarack. 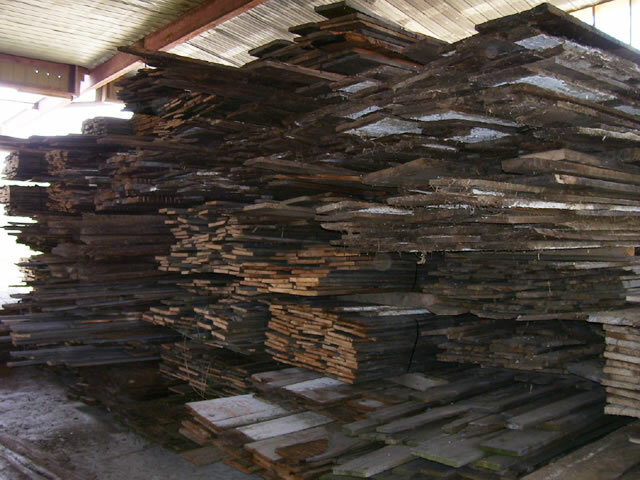 Any of these woods make beautiful reclaimed antique wide plank flooring. 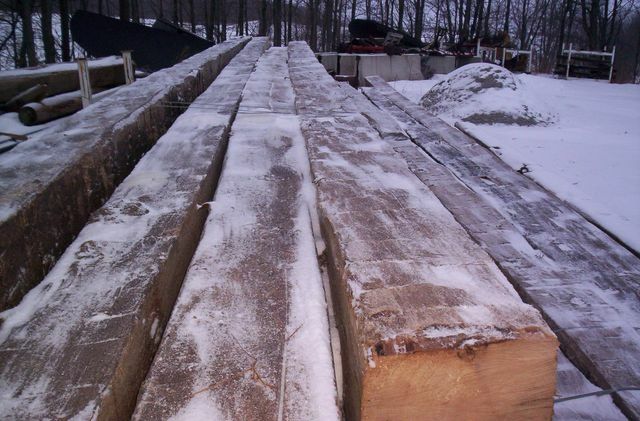 This is reclaimed lumber out of the Queen Ann's Wharf in Toronto, Canada. In the 1850's the Wharf was at the water's edge. As the city pushed into the lake the Wharf became buried. Now, more than a kilometre from the water, construction projects are uncovering this preserved antique timber. 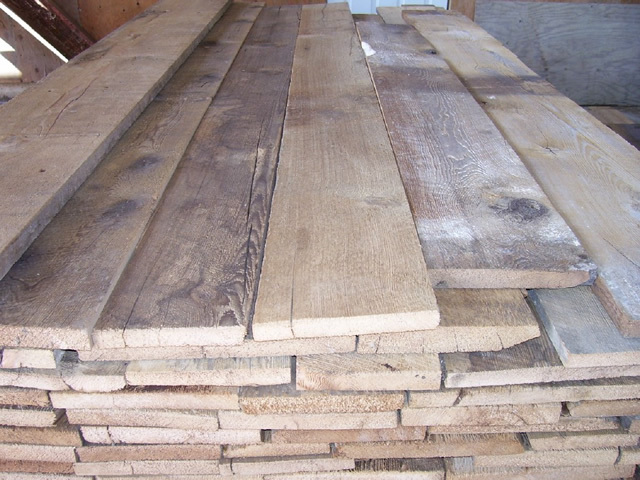 These timbers are sawn into 1 inch blanks suitable for reclaimed antique wide plank flooring. 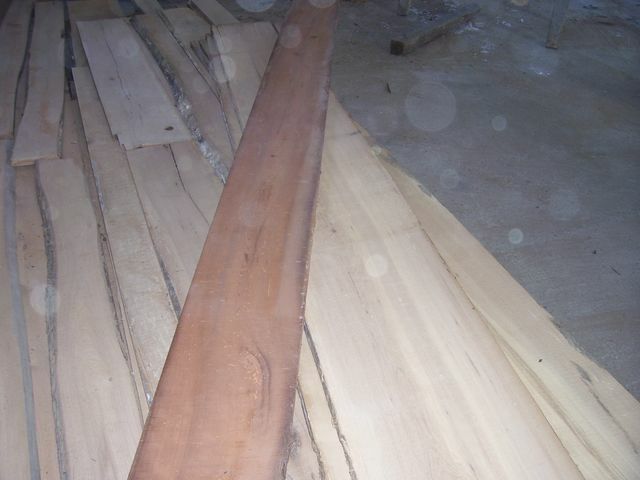 We have also supplied reclaimed Wharf material for timber frame cottages. Imagine the history in those buildings! We moved this reclaimed hand hewn timber frame structure to this location from a neighbouring farm. This building combines reclaimed wood and new wood to create a very rustic, country building. It fits this property perfectly.